Make your biggest day memorable by cutting your wedding cake with beautiful silver-plated cutlery you can engrave with your special day. Your wedding day is one of the most special moments in your entire life, and commemorating this very personal event is important; especially when it comes time to share the symbolic moment of cake cutting. That's why we created this beautiful, silver-plated Strova Wedding Cake Carving Set complete with premium cake knife and cake server. 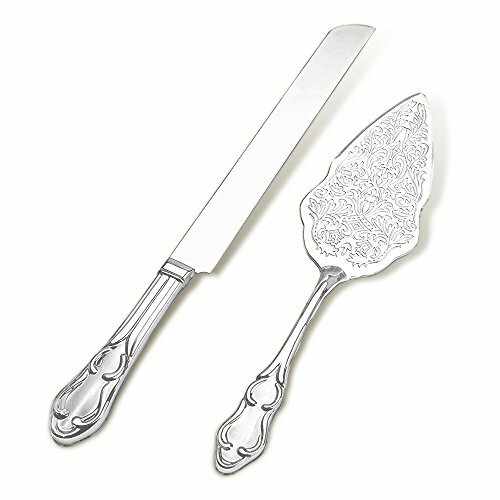 This 2-piece knife and server set adds a touch of elegance to your ceremony that you won't find with simple serving ware. And because they're crafted with a high-quality zinc alloy, you can keep them for a lifetime and even have them engraved so you'll always remember how special your wedding day was. Get this beautiful set today for yourself or a special couple about to get married and enjoy this functional keepsake for life. Get this 2-piece wedding knife and server set today by clicking 'Add to Cart' above now; you'll love the beautiful elegance on your wedding day and beyond! CLASSIC CAKE CARVING SET - This silver-plated wedding knife and cake server set adds stunning elegance to a reception or wedding day with vintage style and bold luster. BEAUTIFUL, PERSONAL KEEPSAKE - Crafted with rust and corrosion-resistant zinc alloy, these engravable wedding cake knife and server will outlast the strongest marriage. PREMIUM SERVING WARE - Each etched-filigree cutting knife features a scalloped edge for safe, precision slicing and a wide server bottom to make serving quick and easy. ENGRAVABLE PLATING - A great gift for engaged couples or early wedding day surprises, engrave names, dates or special sayings on our serving ware to memorialize the day. DISHWASHER SAFE - This luxury serving ware is not only stylish and functional, it's hand wash and dishwasher safe, which means it can be used for other parties! If you have any questions about this product by Strova, contact us by completing and submitting the form below. If you are looking for a specif part number, please include it with your message.